Identification: According to Page and Burr 1991, the Redfin pickerel has a fully scaled cheek and opercle. There is a black suborbital bar slanted toward the posterior. The dorsal surface is dark olive-brown and the ventral side ranges from white to amber colored. There are typically 15-36 dark bars on the lateral side of the adults. There are between 11-13 branchiostegal rays; about 4 submandibular pores; and 92-118 lateral scales (Page and Burr 1991). Native Range: E. a. americanus is species is found along the Atlantic slope from Massachusetts to Lake Okeechobee in Florida; in the Gulf drainages west to the Pascagoula River in Mississippi (Crossman 1978; Page and Burr 2011). Individuals in the south and southwestern part of the range are intergrades with E. a. vermiculatus (Crossman 1978; Lee et al. 1981). Table 1. States with nonindigenous occurrences, the earliest and latest observations in each state, and the tally and names of HUCs with observations†. Names and dates are hyperlinked to their relevant specimen records. 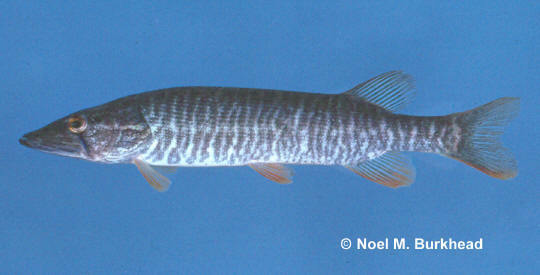 The list of references for all nonindigenous occurrences of Esox americanus americanus are found here. Ecology: This species can be found in lakes, swamps, backwaters, and sluggish pools of streams. Typically found in clear water among vegetation (Page and Burr 1991). Means of Introduction: Typically stocked for sport. Its presence in the Lake Champlain drainage is the result of a canal connection to the native range in the Hudson River (Crossman 1978). Status: Established in the Lake Champlain/Richlieu drainage (Crossman 1978; Page and Burr 2011). Hocutte, C.H., R.E. Jenkins, and J.R. Stauffer, Jr. 1986. Zoogeography of the Fishes of the Central Appalachians and Central Atlantic Coastal Plain. In C.H. Hocutt and E.O. Wiley, eds. The Zoogeography of North American Freshwater Fishes. pp. 161-212. Lee, D.A., S.P. Platania, C.R. Gilbert, R. Franz, and A. Norden. 1981. A revised list of the freshwater fishes of Maryland and Delaware. Southeastern Fishes Council Proceedings, 3(3): 1-10. Page, L. M. and B. M. Burr. 1991. Peterson Field Guide to Freshwater Fishes. Houghton Mifflin Company, New York. pp. 432. Underhill, J. C. 1986. The fish fauna of the Laurentian Great Lakes, the St. Lawrence lowlands, Newfoundland, and Labrador. IN C.H. Hocutt, and E.O., Wiley, eds. The Zoogeography of North American Freshwater Fishes. pp. 105-136.